A series of coronal mass ejections (CMEs) are en route to Earth from a sunspot which will buffet the Earth’s magnetic field during the next 12 to 60 hours. These CMEs are a result of the strongest solar flare in more than four years, which peaked on February 15th and registered as an X-flare. X-flares are the strongest type of solar flare. 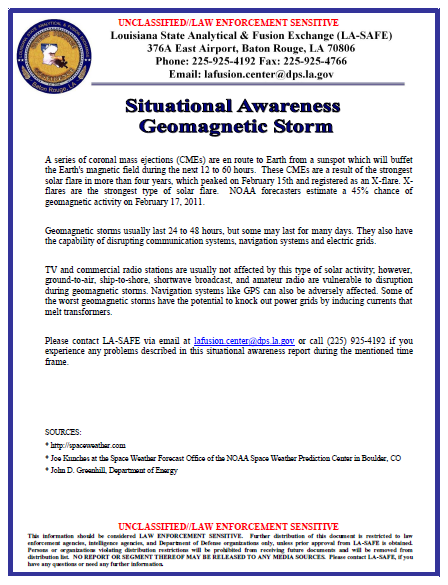 NOAA forecasters estimate a 45% chance of geomagnetic activity on February 17, 2011. Geomagnetic storms usually last 24 to 48 hours, but some may last for many days. They also have the capability of disrupting communication systems, navigation systems and electric grids. TV and commercial radio stations are usually not affected by this type of solar activity; however, ground-to-air, ship-to-shore, shortwave broadcast, and amateur radio are vulnerable to disruption during geomagnetic storms. Navigation systems like GPS can also be adversely affected. Some of the worst geomagnetic storms have the potential to knock out power grids by inducing currents that melt transformers.